The third LG Prada Phone has good improvement over its predecessors. This LG Prada is of the svelte design model. With 4.3-inch touchscreen and decent specs it is good offer for the competitive smart phone market. Running on the Android 2.3 Gingerbread OS the phone has been assured to be updated for the next year. It will be release in Western Europe and South Korea in January. The Prada case comes in black colour. The back of the phone has a lovely textured pattern which presents a semblance of leather coat. The 4.3-inch capacitive touchscreen has LG's Nova technology that brings brightness to double capacity. The thickness of the phone is 8.5mm. 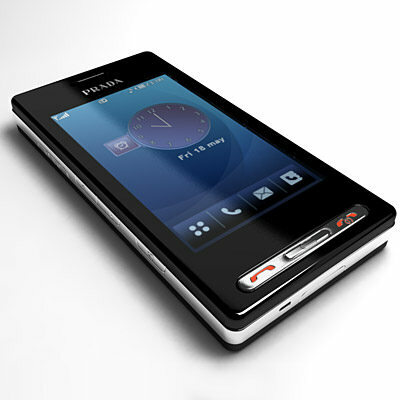 The Prada Phone is powered by a 1GHz dual-core processor. It has 8GB of internal storage and a microSD slot for extending the memory. With an 8-megapixel camera it can shoot upto 1080p resolution video.